Do you remember the blocks of Warwick and Walnut between 40th and 41st? In the 1940s, the entire block behind what was then the Rollins School at 40th and Main was a dense cluster of fairly new apartment buildings. Although most of these buildings on our featured block, 40th to 41st and Warwick to Walnut, are gone today, photos from the 1940s are a reminder of the popularity of the “modern” apartment building of that day. The block as it looked in the mid-1900s when it was packed with middle-class apartment buildings. Many of the buildings are now gone. Sanborn Fire Insurance Map 1909-1950. See a larger version of this map below. This is the block just behind (to the east) of the current St. Paul Episcopal Church and Day School. It is another important block in Midtown history, because it was once the famous orchard of L.A. Goodman, and because in mid 1900s it was home to hundreds of people who for various reasons made their homes in Kansas City’s more modest apartment buildings. As part of our Uncovering History Project, the Midtown KC Post is taking a look at the 1940 tax assessment photos of each block in Midtown. This week we’re focusing on the block from 40th to 41st, Warwick to Walnut. (Many people seem confused by the tax assessment photos, which all include a man holding a sign. Here’s the story behind them). A 1911 plat map showing the Goodman and Price homes on the block. The Goodman home, known as “Forty hundred Warwick,” was described by the Kansas City Star in 1917 as one of Kansas City’s landmarks. Goodman, the Star reported in his obituary that year, came to Missouri in 1867 and bought 53 acres “out south.” Goodman built a red brick home near the corner of 40th and Warwick. The property was in a grove of hard maples and pine trees, the story said. Goodman, president of American Pomological Society and general manager of the Ozark Orchard Company, also had an orchard featuring lots of apple trees on his property. Eventually Goodman sold off some of the property, including the area where the Rollins School was built. Even after cottages were built among the orchard trees, their blooms each spring drew people from all over Kansas City. 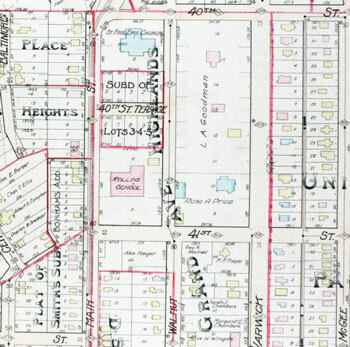 In that 1911 map, Goodman’s only neighbor on the block was Rose A. Price, the widow of the founder of the L.B. Price Mercantile Company. The Price home was of white Carthage stone with a red roof, built in 1899 for $15,000. In the 1940s and 50s, the Price home at 4052 Warwick became the Children’s Convalescent Center, a place where children could spend months or a year recuperating from rheumatic fever. In 1954, the center treated almost 2000 children including outpatients and those from across Kansas and Missouri who were admitted to the facility. The 14-room house was converted into living space, clinics, laboratories, classrooms and a dining space. “It’s the era of apartments,” the Kansas City Star declared in 1909, referring to new construction beginning nearby this block at 43rd and Warwick. By the time the Goodman and Price properties came up for sale, many Midtown residents could no longer afford single family homes, especially the type of mansions once on the block. 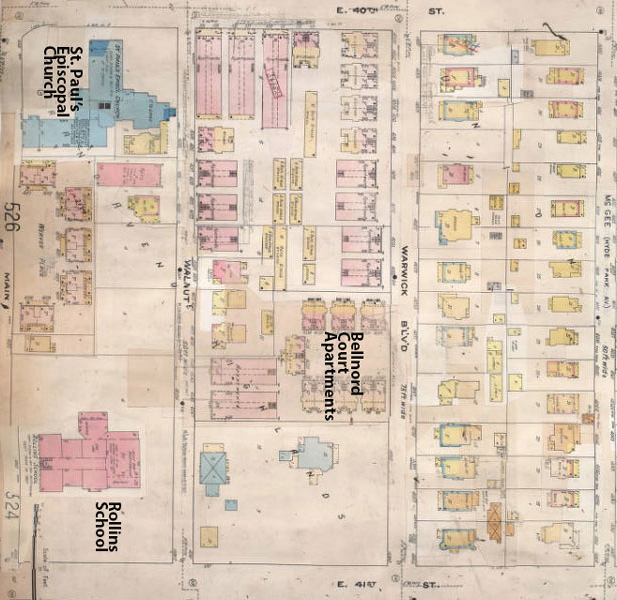 So it is not surprising that a 1909-1950 map of the block shows it packed with six-plexes and long apartment buildings that stretched out long to take advantage of every single inch of buildable space. The slideshow below shows the buildings that stood on the block in 1940. Do you have memories or more details about this block of Warwick or Walnut? Please share them with our readers. What I remember of them is from the end of their existence when they had all become crack houses that were routinely raided by the cops. Oh my goodness, I remember all of these. My first husband and his mother lived at 107 e 41st. The building is still there. It had a large brick and stone porch, living room, dining room 2 bedrooms and a small kitchen and bath. Beautiful hardwood floors and even a nice back porch with off street parking. It was a very nice apartment. Well I remember them more the way Janet did; as nice respectable apartment buildings where I used to deliver the K.C. Star in the evenings. Of course that was back in the late 1940’s into the 1950’s. I was a student at Rollins grade school and attended Cub Scout meetings at St. Paul’s Episcopal Church. I still remember the cooking odors wafting out from under the louvered doors of the apartments as tenants prepared their evening meals. This was before A/C became ubiquitous!